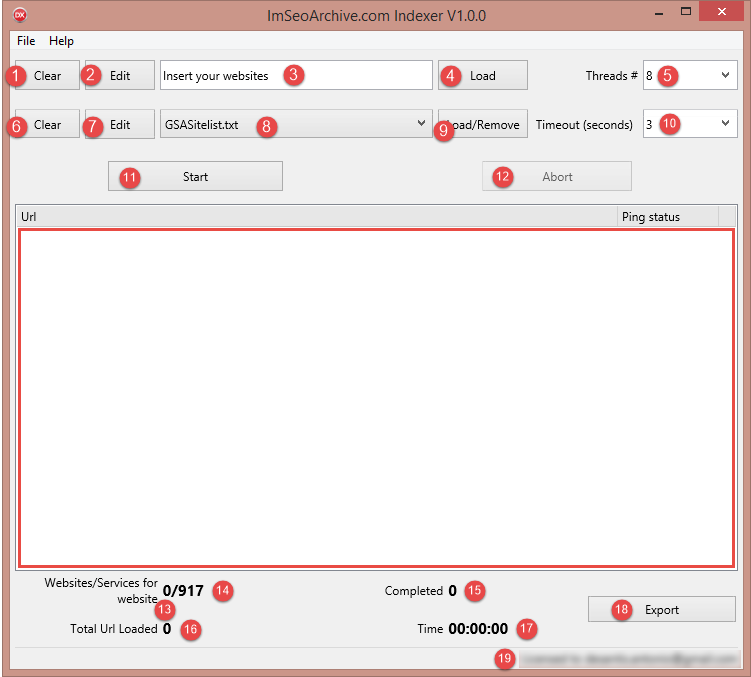 ImSeoArchive indexer can index your sites in a few time. It works contacting indexing services. The search engines in no time will index your sites because they crawl statistic sites continuously. My software can generate some backlinks, all depends from your services list. 2.Edit: Open a text editor to edit your sites list. 3.File path containing your sites list to index. 4.Load: Open the file with sites list to index. After the file is opened its path will appear in point 3 textfield. 5.Threads #: Choose the thread number you want to use to index your sites. If you have a slow internet connection I don’t suggest to growth this value. Threads numbers change according your CPU detected on your machine. For example if you have a PC/Mac equipped with dual core CPU the number increment will 2, 4 for quad core CPUs, etc. 7.Edit: Open a text editor to modify file of services list. 8.You can choose your indexing services. Every line of this dropdown menu represent a list of services. ImSeoArchive indexer already includes files with services lists. 10.Timeout (seconds): you can set timeout of connection. This value can be changed according time that you think will be necessary to respond to your pinging. 12.Abort: abort pinging. This button is enabled when pinging is in progress. 18.Export: you can export the website pinged to txt file. 19.It indicates the email linked to your license.